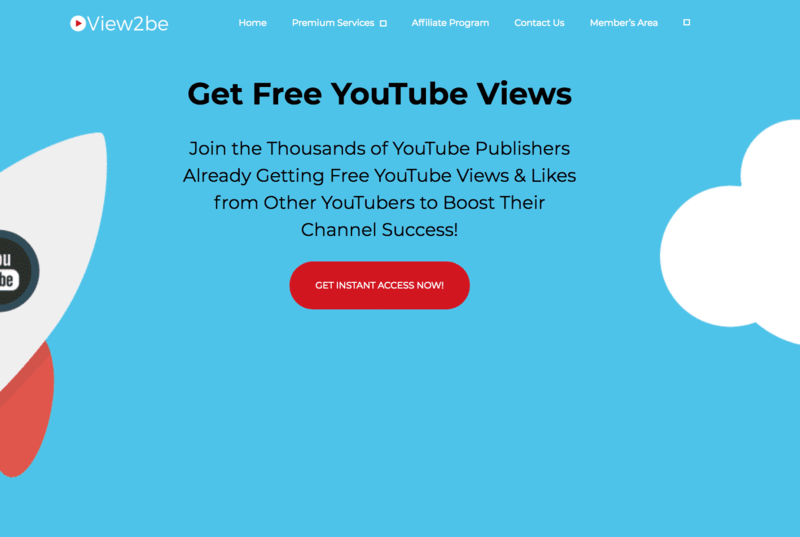 View2be provides Facebook Likes as a secondary service to their main YouTube services. The company’s packages range from 500 to 60,000 likes. They claim that their service will help your page grow faster and draw more audiences. We found their service to be sufficient for most purposes. The likes they provide are said to come from real user accounts, giving them good value. Their prices are at the lower end of the average range offered by most providers. View2be’s customer support is limited, having only a contact form and email. Their agents do respond in a timely manner though. The refund guarantee they provide offers good protection, but they lack a retention warranty for replacing dropped likes. With all these points in mind, View2be is still a good provider for those looking for a quick way to boost the popularity of their Facebook page. View2be is a Canadian social media promotions company established in 2011. While they primarily focus on YouTube-related services, they also offer both Facebook likes and followers plans. The other platform they cater to is Instagram. The site claims their service can help attract attention to your page faster, increasing its popularity. They say they have already helped thousands of users grow their audience on the platform. View2Be offers 10 different Facebook likes packages ranging from 500 to 60,000 likes. According to them, you will start seeing the likes come within 24-72 hours after purchase. No estimated time of completion is given for the delivery of your likes. 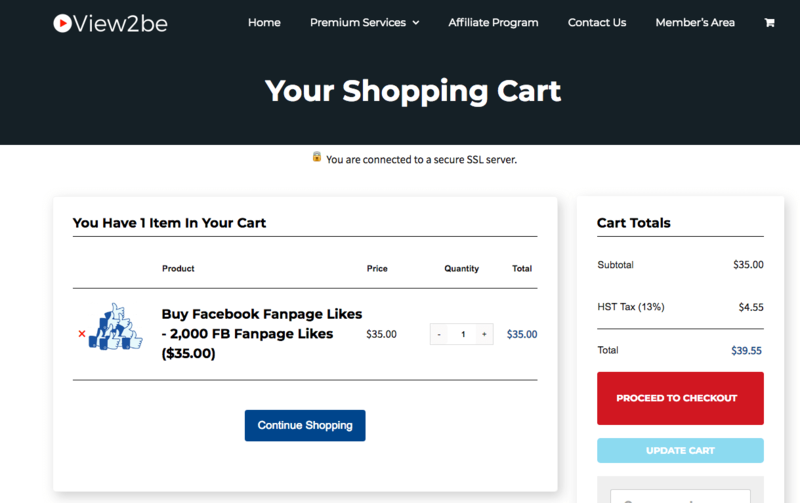 To purchase, select the plan you want and provide your Facebook fan page’s URL. You can pay using either Paypal or Bitcoin. We reviewed the terms and conditions sections on the View2be website and made a few comments on their status below. To find out more details on these, then please toggle the sections to see what we thought! They do not guarantee the complete accuracy of the information posted on their site. By agreeing with their terms, you acknowledge these inaccuracies and will not hold them liable for issues that may stem from these. The site stresses that you are using the information and services they provide at your own risk. It is your responsibility to ensure that the services meet your needs before making a purchase. View2be says that they are not liable for any issues arising from the incorrect usage of their services. The site declares that they collect certain personal information when you register for their service, including your name, email, and preferences. They also track your visit using cookies. According to the company, they use your information mainly to deliver your order swiftly. They also use it for market research and to improve their operations. Furthermore, they might occasionally send promotional materials related to their services through the contact information you have given. You can restrict the information they collect from you by checking the option to disallow collection on the forms you fill up. You may also email View2be’s customer support team at service@view2.be and request for the removal of your information from their databases. View2be provides a full refund for services marked as “Guaranteed.” You need to contact their customer support team to request for one. Prior to providing a refund, they will find ways to resolve your concern. If they can’t find solutions to your issues, the amount you will receive is solely based on their discretion. The site does not provide any retention or replacement warranty for dropped Facebook likes. 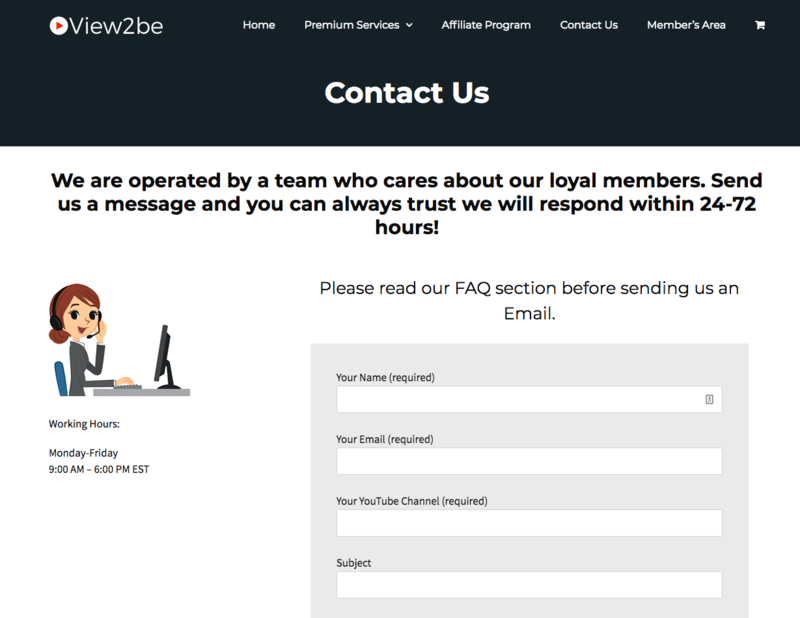 View2be has an on-page contact form as their main means of customer support. According to their site, they will respond within 24 to 72 hours after you have sent your message. You can also use their service email service@view2.be for inquiries. One thing we wish they would provide for their Facebook Likes service is an FAQ section similar to those found in their Youtube services page. We recommend View2be’s Facebook likes service if you want a quick way to boost the popularity of your page. They offer a good selection of package sizes, giving you plenty of options to achieve your social media goals. Their prices are slightly lower than average, making them cost-effective. Their lack of a clear retention policy is our only real concern. View2be says you will start getting likes within 24 to 72 hours after buying them. They did not give a specific time for delivery completion, which might be a bit of a concern for some buyers. View2be provides high-quality likes coming from actual users. The site mentions that they overdeliver on orders, giving you some extra boost. View2be does not provide any information about how long the likes will stay on your page. We wish they had this information somewhere on their site so that they could be held accountable in some way. This, in our opinion, is the biggest drawback to their service. Despite being a secondary product, we like that View2be still delivered a solid service for its Facebook likes service. The packages they provide are affordable and have a good variety, ranging from 500 to 60,000 likes. The likes are also top-quality and are delivered fast. In addition, the company provides extra likes, which could cover any drops that may happen in the future. Their customer service is a bit wanting, as you only have a contact form to reach them. Their agents do respond quickly respond in a friendly manner to make up for this. Their refund policy is decent, we just wish they coupled this with a replacement warranty for dropped likes. Despite these issues, we still think View2be is a good option if you want to get high-quality likes for your Facebook page. Give them a visit by clicking the button below and see for yourself what they have to offer. My need to grow my YouTube channel views was well taken care of by the team at view2be. I only made contact via their site, and the rest was seamlessly done. I must say it was great!